PM May victory in the House of Commons leans the scale toward a tougher Brexit. UK inflation came in-line with market's expectations, Fed's decision up next. The GBP/USD pair eased from its Tuesday peak at 1.3424 and traded at weekly lows ahead of key UK inflation data releases, undermined by increased dollar's demand and speculation about a tougher Brexit coming after Tuesday's outcome of the Commons' vote over the Brexit bill. After PM May made "concessions" to rebel Tories, she finally managed to reverse the Lords' vote on the exit day and the "meaningful vote" granted to the Parliament. The pair traded at around 1.3320 when UK inflation came out. The Consumer Price Index was up 2.4% YoY in May, slightly below market's expectations, while the core reading remained at 2.1% as expected. For the month, inflation rose 0.4%, also in line with market's forecast and the previous figure. 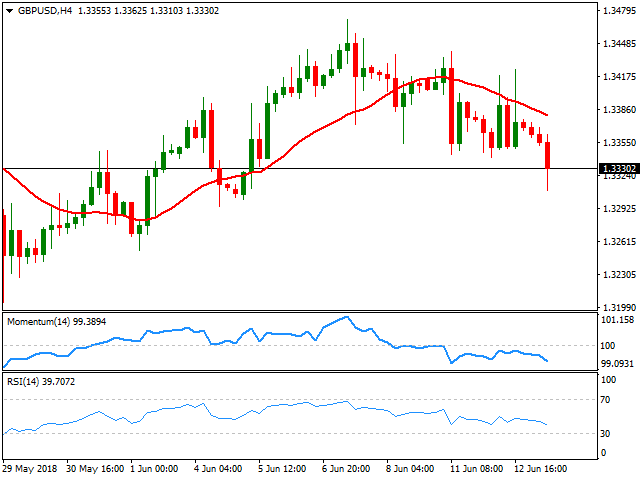 The market's reaction to the headline was quite limited, although the Pound managed to recover some pips with the release, with the pair bouncing from a daily low of 1.3310. Later in the day, the US Federal Reserve is expected to raise rates 0.25%, in a movement largely anticipated and mostly priced in. Investors will be focusing in the dot-plot and inflation forecasts, and any possible change in the statement's wording toward a more hawkish stance. The 4 hours chart for the pair favors additional declines ahead as, despite multiple attempts, it was unable to advance beyond a bearish 20 SMA, while technical indicators accelerate their slides below their mid-lines. A break below the daily low should lead to a continued advance towards 1.3265, while further weakness exposing the 1.3220 region.